Description This Bainbridge, Georgia hotel has an indoor pool, free internet access, non-smoking guest rooms and free breakfast. An indoor pool and non-smoking rooms with free Wi-Fi microwaves and refrigerators are just some of the top amenities at the Holiday Inn Express Hotel & Suites Bainbridge. The bright and modern four-story hotel has 72 non-smoking rooms with free Wi-Fi flat-panel TVs microwaves refrigerators and coffeemakers. The hotel delivers a free newspaper to the room every weekday. There's a free continental breakfast too. Before setting out for the day catch up on work at the 24-hour business center take a refreshing dip in the heated indoor pool open year-round or burn off some carbs in the on-site cardio fitness room. The hotel is two miles from Bainbridge's center. Located off U.S. 84 it's about a five-minute drive to the Firehouse Center and Gallery. Bainbridge is on the Flint River in South Georgia where bass fishing is very popular; Lake Seminole is about 35 miles away and Bainbridge State Park is across the Flint River about three miles away. The Tallahassee Regional Airport is located about 38 miles away in Florida's capital; Jacksonville International Airport is 210 miles away. 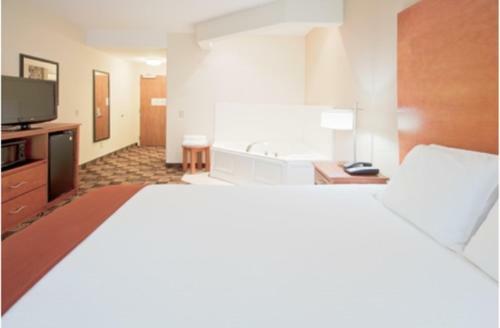 Add Holiday Inn Express Hotel & Suites Bainbridge to your free online travel itinerary.